To work alongside other companies in developing a beautiful sensory garden with a focus on vision and touch. To design a building that would sit on a raised platform and link to a wooden walkway, forming a prominent central feature in the garden. The building had to be dual purpose: it needed to be used by the children for play, but also form an outdoor classroom in the summer. A large circular gazebo was the perfect solution. 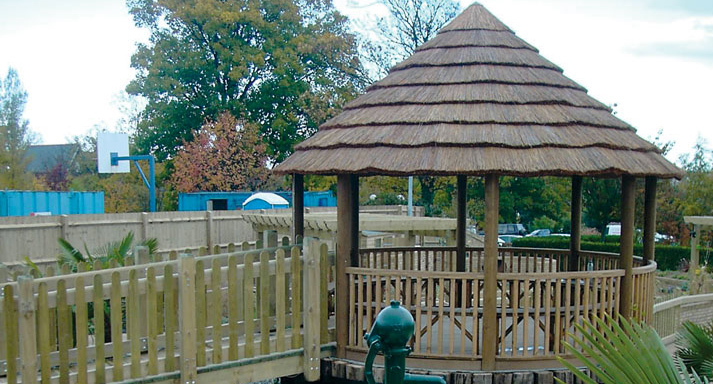 The circular timber and thatched building was ideal, ensuring 360 degree, uninterrupted views, and the natural, warm texture of the wood made the building interesting for the children. Aesthetically, the thatch worked beautifully with the garden design. The circular bench seating ensured that a class of 30 children could enjoy an outdoor lesson in the summer with protection from the sun.